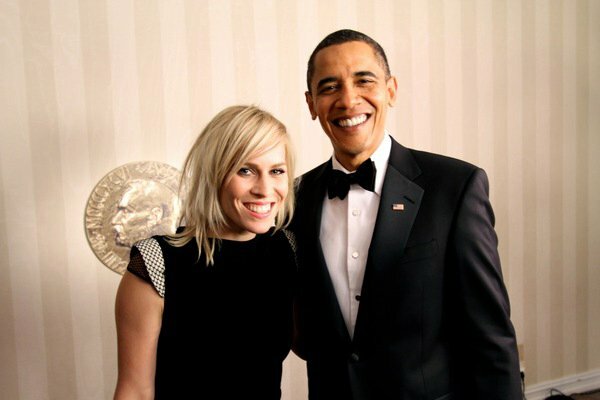 Angel Ambassador Natasha Bedingfield sang Motown classics as part of US Black History Week at the White House earlier this year. Natasha sang to an intimate audience at, ‘The Motown Sound: In Performance At The White House,’ with renditions of Motown classics such as ‘Stop In The Name Of Love’ with Jordin Sparks and Ledisi and ‘The Tracks Of My Tears’ as a solo performance. Natasha was met with a huge support from the audience, which included Barack and Michelle Obama, Stevie Wonder and Smokey Robinson. In particular her soulful performance of ‘The Tracks Of My Tears’ received a standing ovation lead by President Obama himself and was resounded around the room. Natasha also sang for Obama at the Nobel Peace Prize in December 2010 (photo above). The Nobel concert, hosted by Will Smith, was broadcast to a global television audience and also featured artists Wyclef Jean and Westlife, among others.